Everyday we learn a new thing – at least we should – and modelling is probably a good teacher in that regard. 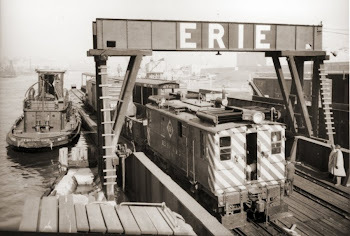 While working on my pair of Erie 37500 series gondola I got a lesson where I expected it the less. As a starting point, I’m using the old Roundhouse 40ft gondola. Some will object it’s a crude model by today’s standards but details are crisp and the number of panel fit the Erie prototype I’m trying to replicate. Certainly, there are some discrepancies in length, but this high side gondola fits decently the bill. 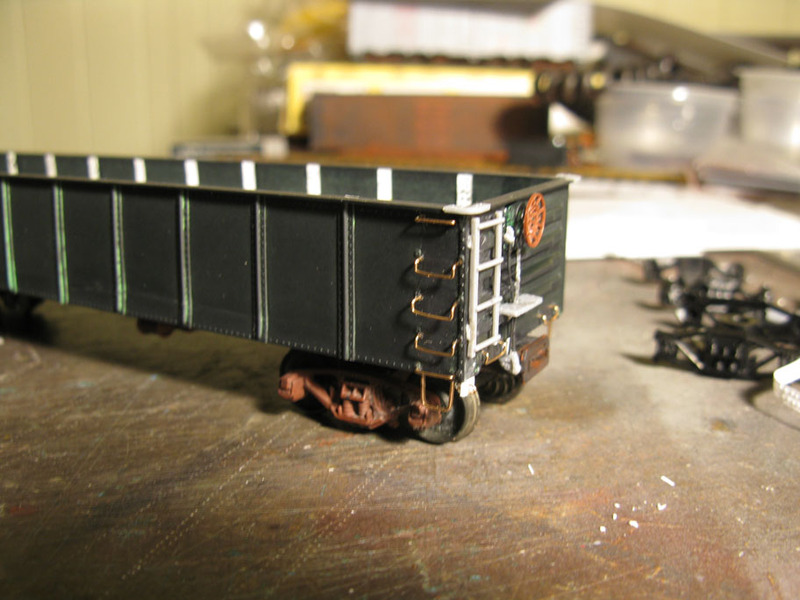 My approach is to make it more credible by installing wire iron grabs, A-line metal stirrups, improving the braking gear, replacing the trucks, thinning down some section profiles and redetailing the bare interior. 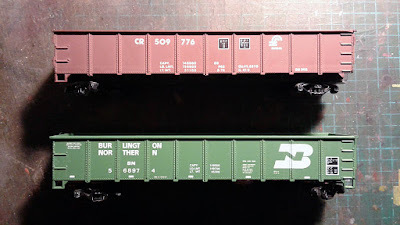 In short, it’s a typical rolling stock improvement project that should take a few evenings to complete at a leisure pace. 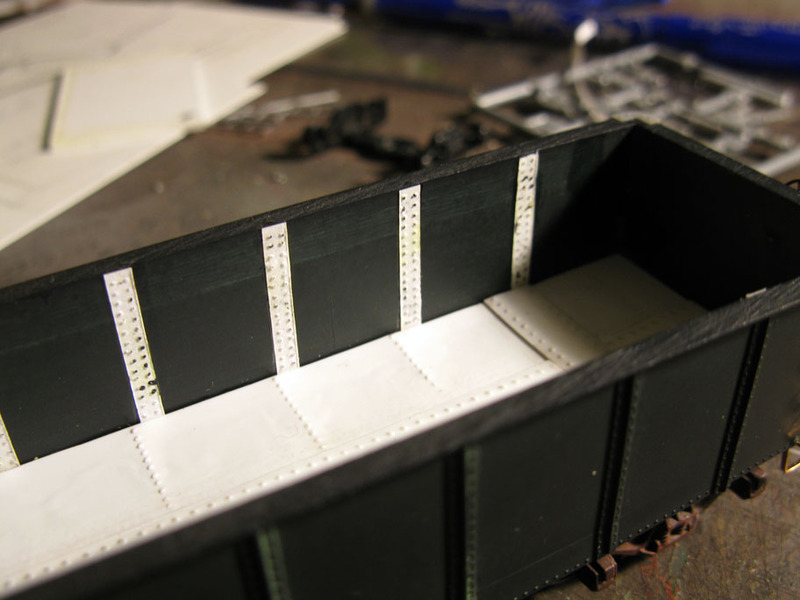 The problem arose when I made a new steel deck with hand-punched rivet details. I was quite proud of my work and thus decided to glue it on the bottom of the gondola. My first idea was to simply secure the bottom with a few drops of CA glue, however, the rivet punch process slightly warped the thin styrene sheet and I was afraid this could impeded the bond. Thus, I decided to simply brush a generous amount of solvent-based glue on the gondola and cement permanently the new deck. At this point, all was fine. However, on the next evening, I found out the car sides had badly warped toward the interior and by a large margin. Using my hand, I carefully pressed the warped parts outward by applying a certain amount of force. I thought the sides were affected by the glue bond at the perimeter of the new deck… But imagine my surprise when the next day, the car sides were once again badly curving inside. Not only that, but now the deck itself was sagging the middle. It didn’t take long to find out the problem. The gondola bottom had warped significantly due to the solvent used to cement the new deck. 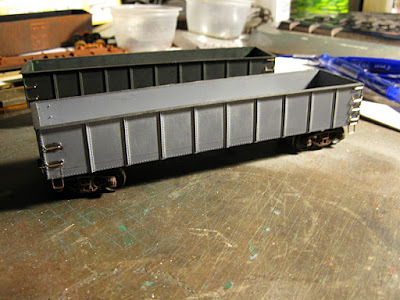 When I installed the metal underframe, it no longer sat on the plastic shell but rocked on the curved bottom impeding the trucks movements. Big problem!!! What happened was a simple and well-known phenomenon. When laminating two different materials, they have a tendency to warp when both have different characteristics. Generally, the process takes some time and is gradual. In my case, the generous use of solvent softened the plastic to the point that when materials hardened and cured in the following hours, their different rates of contraction created a disaster. The result was predictable to some extent, but little did I know a 1 mm bulge would manifest itself in such a spectacular way. At this point, I was able to straighten the gondola sides. However, the only practical solution to repair the warped bottom - which should be better described as a belly - was to shave down the bulge with a chisel. 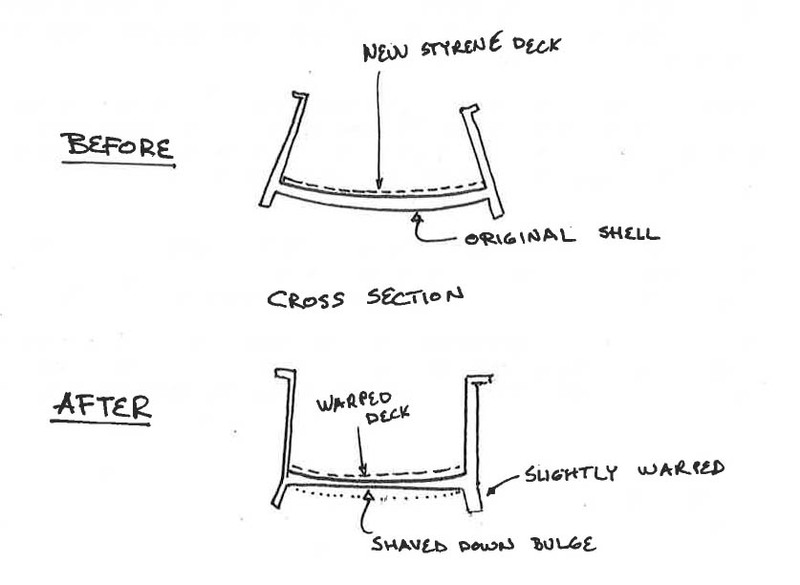 It surprisingly went well, but it certainly didn’t address how badly warped the steel deck look. If it was a wooden gondola, I wouldn’t care since these cars were generally badly warped and sagging in old pictures. Unfortunately, steel cars generally keep their shape better. From there, I had two options: try to fix up the deformation or simply cutoff the car bottom and replace it with a brand new one. In both case, it was a question of releasing the built up stress in the plastic. While at first I was leaning toward a full reconstruction, my long experience with resin figure garage kits kicked in. I plugged the hairdryer, set it to maximum heat, and applied evenly the hot hair on the car. I made sure to soften the plastic until it was malleable but was carafully enough so details start to molten. I didn't keep track of time, but it was less than a minute. When the car was soft enough to be reshape, I put it bottom up on a flat surface and gently pressed down the belly uniformally. When the shape was restored, I kept pressure until the plastic hardened again. As expected, the gondola sides straighened and the bulge disappeared once for all. 24 hours later, both cars were still keeping their shape thus I resumed the redetailing process. I was also a good occasion to address will laziness toward molded on ladders. At first, I'd planned to remove them, then decided to keep the ladder and save myself a tedious task. But after all the effort put on the cars, it was silly to still keep clunky ladders. I heard the voice of reason, took my chisel blade and scrapped off the unwanted details. While I was able to repair my horrible mistake, I've learned my lesson. 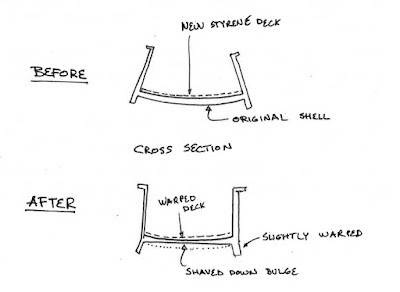 Next time I face a similar challenge, I will superficially glue the new deck with non-solvent based cement to eliminate altogether the risk of warping. I’m certainly not proud of myself for what initially seemed to be a well done job. Once again the old rule applies: use as little glue as needed. For some reason, we have a tendency to believe styrene is a stable material compared to wood or cardboard, but this is far to be true. Styrene (and other plastics) is surprisingly vulnerable to warping and I've seen more than my share of projects going awry in a matter of days or weeks. But enough about mistakes... The rest of the project was relatively straight forward, involving a new Accurail gondola brake apparatus, retainer valve and details from Tichy and a Kadee brakewheel. I went as far as adding the fulcrum and installing a bracket for a cut lever. Also, riveted steel straps were added inside the wall of the car as it did exist on some gondola. 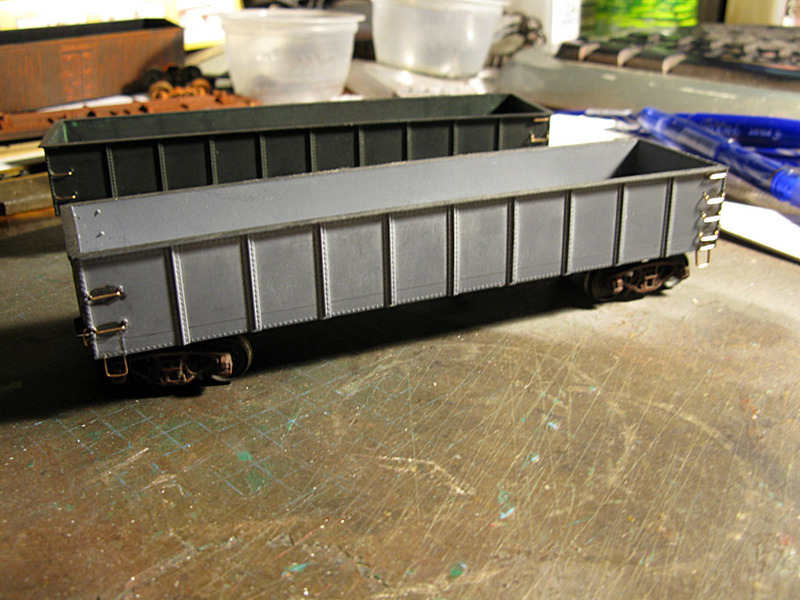 It was to reinforce the impression this is a real steel car and not a one piece injection-molded shell. The goal is simple, these cars, even if they are prototypically accurate should at least have the same level of detail as a Proto 2000 or an Intermountain car. My reasoning being discrepancies in details are much more noticeable than overall accuracy. The model should look like a real car and have the basic features. From that point on, sky is the limit.